Clamps adjustable range:36" - 44"
4. Perfect Solution to hold luggage/cargo/snowboard on roof when you are on travel. 5. 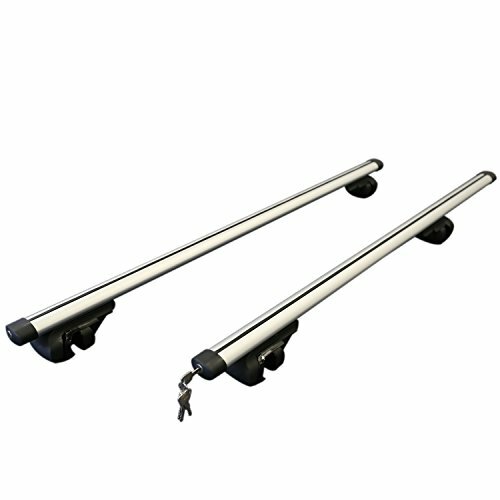 The roof rack comes with everything you need: 4 base feet, 2 cross bars (48"), mounting accessories. 6. It's completely removable. The roof rack is easy to install and requires no tools. 7. The base feet are black, the cross bars are aluminum with a silver coating. 【High Quality】Crafted from High Quality Light Weight Aluminum with Adjustable Clamps. 【Can Support Luggage】Ladder or Cargo's Weight up to 198 lbs,Helps to Secure Belongings from Sliding Off. 【Easy installation】light weight and very durable,Width Adjustable Mounting Clamps to Fit Large Variety of Vehicles. 【Power-coated surface】Water-proof and anti-corrosion, Streamline water drop design, effectively reduce wind resistance & noise. If you have any questions about this product by 5A-Parts, contact us by completing and submitting the form below. If you are looking for a specif part number, please include it with your message.